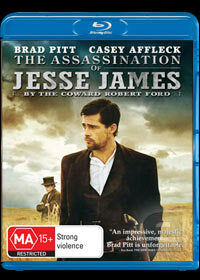 The Assassination of Jesse James by the Coward Robert Ford is almost an art house film due to its cinematography style and deep and intereststory which is based on the novel by Ron Hansen. The premise behind the film begins several hours before Jesse James final train robbery and how this led to the dispersion of his gang and the eventual murder of this legendary American character. The movie is amazingly directed by Andrew Dominik (Chopper 2000) who does a wonderful job at immersing the actors into this almost period drama with Brad Pitt as Jesse James and Casey Affleck as 19-year old Robert Ford who idolizes the enigma of Jesse and his brutal gang. At times, the movie is quite psychological as it gives the viewer a true insight into the motivations of the characters in the movie that at times seems like they are common thugs, almost animalistic in nature with no human conscience whatsoever. The movie also has an exceptional supporting cast that includes wonderful performances by Sam Sheppard as Jesse's brother and Sam Rockwell as Robert Ford's almost serial-like killer Charlie. Match that with Warren Ellis' amazing musical composition and The Assassination of Jesse James by the Coward Robert Ford is a very engaging movie that will draw you thoroughly into the beginning, until the devastating destruction of all those involved by Jesse's legacy. On Blu-ray, the cinematography looks amazing and truly brings out the hues and colours of the American landscape with extraordinary clarity. Match that with the Dolby Digital soundtrack and this is a first classic cinematic experience. A brilliant story, perfect video and audio, this movie is almost perfect!